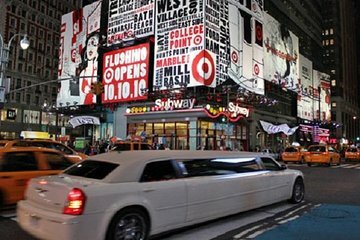 Enjoy a private, customized tour of New York City in a limousine. Choose between a 3- and 4-hour tour and select from any number of popular locations, like Times Square and the Theatre District, Central Park, Midtown Manhattan, Lower Manhattan and the Brooklyn Bridge. Focus on one area or see it all. Multilingual tours are available in English, Spanish, French, Italian or German. A hotel pickup and drop-off is included. The price shown is per tour, for up to nine guests.